Biscuit is a delicious lush cakes, which the hostess cooks the cakes. As a rule, for its preparation using flour, eggs and sugar. Some cooks add to the batter and sour cream. Take the eggs, wash them. Separate the whites from the yolks and place them in different bowls. The plate with proteins put in the refrigerator, as they are better chilled whipped. In the bowl of yolks add Cup sugar and wait until the grains are fully dissolved. Whisk the ingredients with a mixer until the foam. Add a Cup of sour cream and mix everything carefully. Take the flour and sift it. This needs to be done to flour saturated with oxygen. As a result, the biscuit will be more lush. Get proteins from the refrigerator and whisk them with a mixer, the foam was more dense before whisking to proteins add a little lemon juice. Take a big dish and connect the prepared yolks and whites and flour and gently, but mix everything well. When you add the flour do not use the mixer, otherwise the dough will settle, better to use wooden or silicone spatula. Grease a baking pan with vegetable oil and carefully put in it the dough. Preheat the oven to 180 degrees. Cake, mixed with cream, does not like high temperatures. Put the form in the oven. 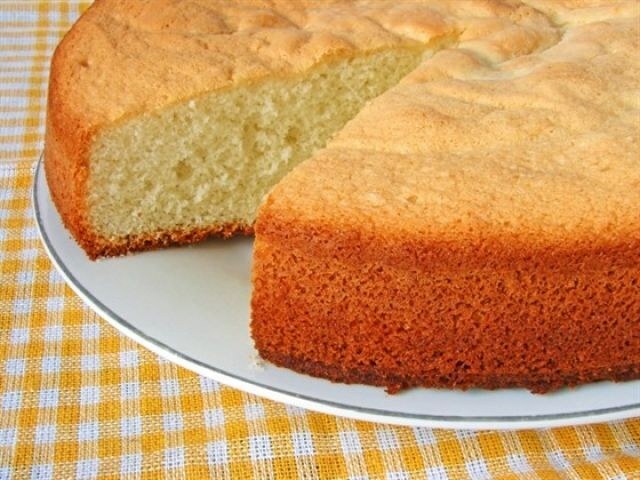 When cake rises, lower the temperature to 160 degrees. The finished product is take them out of the oven and put on the rack to cool down, then the bottom will not be soggy. Slice the cake better with a special fishing line. When serving, garnish it with powdered sugar or a glaze. You can also make a cake using several layers. During baking do not open the door of the oven. Biscuit dough is quite capricious and can settle. For baking, use only warm the flour if you have it stored in a cool place, give it time to warm up. Buy only the flour.